Installation of eighteen thrown porcelain pots in six glazes in shades of white and yellow stacked in a steel case with a horizontal opening at the front. Thrown using Limoges porcelain, turned, glazed with a six different glazes, fired to 1270 degrees Celcius. Marked with a variety of seals. The case is laser cut mild steel. Purchased with support from The Art Fund. Arcady, Edmund de Waal, 2007, © Edmund de Waal 2007. 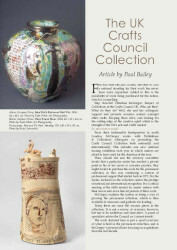 Crafts Council Collection: P489. Photo: Heini Schneebeli. - First use of metal to provide a context and frame for the work. - Called Arcady in reference to a Poussin painting at Chatsworth which is very melancholic, it's all about not being able to touch. - This as a general theme, is very important: this is the transitional piece towards where the procelain objects can't be touched, are not handlable.